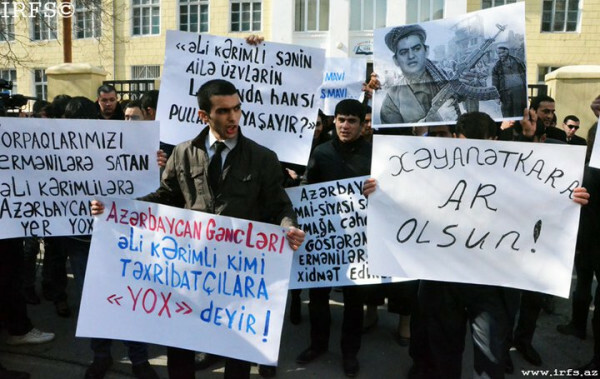 Amnesty International reports on intensifying “wide-reaching and ruthless” crackdown by the Azeri authorities on opposition, freedom of speech and any sign of decent. The latest incident took place today, when government sponsored youth & co targeted opposition politician amid further detentions of political activists. "The Azerbaijani government's pre-emptive crackdown on those seeking reform has been wide-reaching and ruthless," said John Dalhuisen, Deputy Director for Amnesty International’s Europe and Central Asia Programme. "The increase in the number of incidents of harassment and violence against activists and journalists in Azerbaijan is deeply concerning. The trend appears to illustrate the determination of the authorities to stamp out any forms of dissent," said John Dalhuisen. @leylanajafli provides with additional details: “These placards had slogans like “There’s no place in Azerbaijan for the Ali Karimli’s of this world, who sell our land to Armenians!”, “Shame on the traitor!”, “Ali Karimli, what money does your family live on in London?” and “Ali Karimli + radical islamists = chaos”. This comes after yesterday’s rumors spread by pro-Aliyev media outlets stating that Ali Karimli was to meet and “conspire” with a number of radical Islamist groups. Just had a glance at that video (below). Pretty disgusting crowd, I must say. Nauseous. It truly is, Ani. And thanks for the link. My shopping basket. The content.